Have you ever eaten something that you keep thinking about for days and days after? There is this cookie shop in Utah called smart cookie and their frosted sugar cookie is killer, i mean like one of the best cookies i have ever eaten and every time we go back to visit Matt’s family i make sure and down a half a dozen during the trip. I’m a big fan of iced sugar cookies but up until yesterday i’ve never thought mine quite rivaled smart cookie. Well friends i think i finally did it, i finally made a cookie that has the same texture and moist-ness and topped with icing is more addicting than crack. 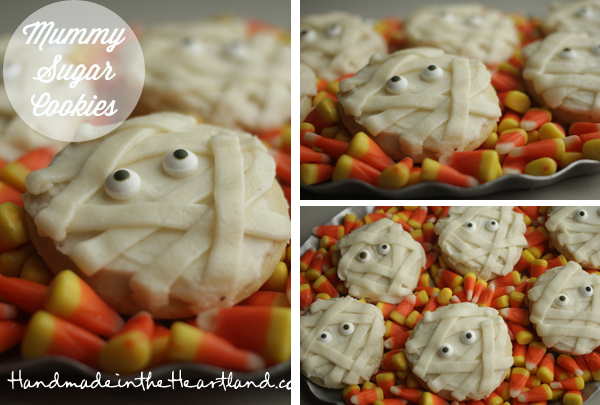 I whipped up a batch because i had the opportunity to do a segment on fox 4’s morning show here in KC and i wanted to make some mummy cookies. They turned out so adorbs, seriously how cute are those guys?! ** A few disclaimers before you watch the video, Nick misunderstood my bio and said i moved here from NYC, we actually moved from Rhode Island where i went to college. And here’s a big one- i used latex gloves and stuffed them with Candy to give out or use as party favors, which through fb and other means i have been told is a bad idea because lots of kids have a severe latex allergy. So make sure you use non-latex gloves! This root beer created the coolest effect while its “brewing”. It’s perfect for a Halloween party! I put mine in a big plastic “cauldron” i found in the halloween section at big lots. So first step is to make a simple syrup, over medium heat in a heavy saucepan combine the sugar and 3 cups water and stir until the sugar dissolves. Remove from heat and add the root beer extract. Let cool. I made my syrup the night before and then put it in the fridge over-night, from what i have read if your water is warm or hot the end product does not turn out as well. Putting it all together- first add the syrup and then the 1 1/2 gallons of water and then carefully put your dry ice in. I’m sure you could put the dry ice in first and then put the liquid in, it probably doesn’t make a difference what order they go in. Be careful with dry ice, you can def. hurt yourself with it. When you put the dry ice in you will get a continuous amount of “steam” or “fog” until it dissolves/evaporates/works its magic into the water. Once its completely evaporated then you can drink your root beer, about an hour. *So like i said above, when i made these i did not even think about the fact that so many kids have latex allergies, so make sure to use non-latex gloves! I think these are super cute, i probably wouldn’t hand them out to trick-or-treaters, but maybe a party favor to friends coming over or if i wanted to drop some halloween treats off to friends of mine i would use this little idea. 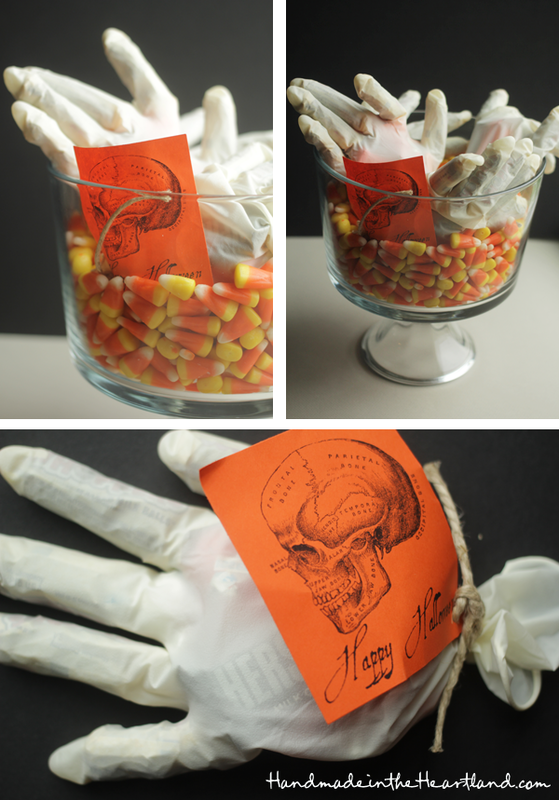 All i did was stuff the gloves with candy, tie the ends with twine and add the cute little Happy Halloween skull printable. You can download the printable for free HERE. Preheat your oven to 350. Cream the butter and sugar until combined and smooth. Add the eggs. Add the vanilla, and sour cream and mix until combined. Add the soda & salt and mix until combined. Add 4 cups of flour and combined and then add the rest. Turn your dough out onto a floured work surface or a Roul’pat. I can’t say enough about my demarle roul’pat, no need for extra flour because nothing sticks to it and it makes my life so much easier! I’m pretty sure the magic trick to making these super super delicious is rolling them out thick, like 1/2″ thick. Bake them for 8-9 minutes and let them cool completely. Cream your butter until it is super smooth. Add most of the powdered sugar, the milk and the vanilla and mix on low speed. (When i was taking a cake decorating class the instructor told us that the most common error is over-mixing icing, and if you never go over the first speed on your mixer once you put the powdered sugar in you wont over-mix it.) Keep adding the rest of the sugar until its smooth. Sometimes depending on elevation and humidity you may need to add a little more liquid or sugar, just look at the consistency and make the call. 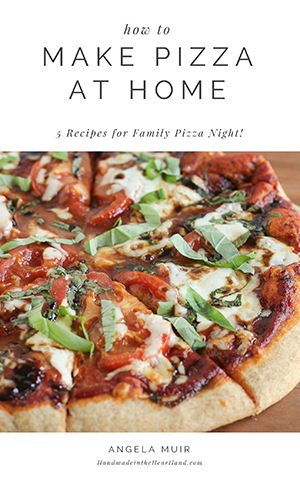 This recipe is pretty foolproof, i use it for everything! For decorating the mummies i first iced the cookies with a nice thin layer of icing, then added the eyes and then using a flat tip (#47 by wilton, if you are interested) in a pastry bag i made the mummy strips by just pulling my had across as i squeezed out the icing. It’s really pretty easy and looks super cute!